Better teaching shouldn't be code for "more work." Small adjustments in instructional practice can lighten teachers' burden and improve learning. During a coaching session, I once asked a group of teachers to talk to the person next to them about the strategies they use to reduce their workload. The room was silent. Then people started to laugh. Capturing the moment beautifully, one teacher at the back of the room put his hand up and with a broad grin said, "Working more?" 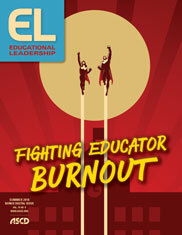 Sometimes, it appears educators view unreasonable workload pressures and burnout as unavoidable occupational hazards. Or, if these issues are raised in schools, they're discussed solely as a matter for union negotiations. Yet, as many educators know, unmanageable workloads can impact every aspect of teacher practice. This is a blind spot in school-improvement efforts. I don't come across many research studies on new teaching practices that include a specific analysis of the time it will take to implement and maintain them. I rarely see schools do a time management study of school-change initiatives. I don't know many teacher-training programs that include a component on managing the workload associated with teaching. These are big oversights, because good teaching isn't just important for increasing student gains—it also has to be sustainable for teachers. As an instructional coach who runs workshops for teachers in professional crisis, I have seen close-up how the burden of workload leads directly to teacher burnout. Many times, I have witnessed dedicated and conscientious teachers who have become overwhelmed by their teaching obligations. This is not because they were underperforming or misunderstood what was required of them, but because they tried to live up to an unrealistic model of what good teaching is. What would it look like if educators better recognized time and workload as variables when we discuss good teaching practices? Let's use assessment, or grading practice, as a case study. Sometimes it is hard for teachers to see what really good assessment practices look like because huge piles of unmarked student work get in the way. One recent survey found that, on average, teachers work 14 more hours per week than they are paid for; and the majority of that time is spent on "preparation, planning, and particularly … marking. "1 Many teachers "solve" this problem by simply working harder—staying longer at school to correct work or carving out more time from their personal life to do it at home. This is just not sustainable. Could you hone your questioning technique so you get more feedback without students ever having to put pen to paper or you having to mark written work? Could you do more to establish the learning objective at the outset of the lesson (or sequence of lessons) so that students can target their efforts and you can spend less time later correcting misconceptions? Could you develop a wider array of techniques—including alternative testing strategies such as closed/open testing—to elicit feedback that is fast, formative, and frequent? Could you use more techniques for both reducing your correction workload and speeding up how quickly you mark? Could you get your students to take a more active role in the correcting process, so you can make better use of the limited time available for assessment? Let's look at this last question as an example of how addressing these queries can change how you assess written work and alleviate the burden associated with excessive correction. How then do we avoid this trap? One way is to have a toolkit of strategies that nudge students to play a more active role in the feedback cycle and reduce the amount of time you spend correcting work. Such strategies will help ensure that your students do their fair share—and serve as a reminder that it only takes small changes in practice to substantially improve the dynamics of your classroom. Pedagogy that is designed with your time and workload limitations in mind can be revelatory—not because the changes are so substantial, but because these variables are so rarely considered. "I always thought that 'better teaching strategy' was just code for more work," one teacher told me. Error Flagging: Instead of correcting surface errors, spelling mistakes, factual inaccuracies, and so on, you simply place a dot or dash at the start of the line in which the errors appear. It is then your student's responsibility to find and correct this mistake. (If you have a student who might struggle to identify the error, then circle a word or phrase to provide more direction.) This approach speeds up correcting and encourages students to better proof their own work. Error Counting: Rather than noting on a test or quiz whether an answer is right or wrong, with error counting you divide the work into subsections and give students a subtotal mark for each section. It is then their responsibility to work out which questions they got right or wrong based on the subtotal, asking themselves, "I got three out of four right for this section—which one did I miss?" This works particularly well in math and science, but I have seen it work on everything from weekly elementary school spelling tests to high school pop quizzes in English class. Student-Generated General Comments: Annotate your students' work as you normally would, identifying errors and writing margin comments. Then, instead of writing general advice for the student, ask them to write a general comment summing up your advice. Inverting this shared approach to correction—with you writing a general comment and students having to correct their work in light of this advice—also works well. Model Correcting: Select a representative portion of the student's work to mark. Closely annotate and correct this section of their submission and then ask them to make changes to the rest of the piece based on your feedback. = The same standard as your previous work on the topic. < A better standard than your last work on the topic. > A lower standard than your last work on the topic. I like using this approach in my classes because it discourages students from comparing their grades to others and gets them to concentrate on their own improvement—thus focusing their attention on the comments I spent time creating rather than just looking to see what grade they "got." I always found that when using alternative grading schemes like this one, students took up my advice more readily and I spent less time re-teaching the same concepts. For example, I recently told a student that an introduction for a text essay should discuss ideas, not events. The student paraphrased this back to me as "Make sure your intro analyzes rather than summarizes the book," letting me know that they understood my feedback. This strategy only adds an extra moment to a teacher-student conversation but ensures the exchange is a much more efficient use of your time. The earlier the feedback sticks in the process, the fewer corrections teachers will have to make down the line. Calculation errors: where a student has made simple mistakes working out a problem. Conceptual errors: where the student doesn't understand how to solve the problem. Teachers usually do the work of identifying patterns of error, but with training this is something students can do, too. In my experience, this makes students much more likely to recognize error types themselves and to work harder on addressing these gaps in their understanding. It also reduces the total time spent marking up student work. One teacher I worked with was reluctant to adopt these strategies but eventually tried error flagging to great success. "Who'd have thought," he observed, "that the answer to having to do so much is not to do it all yourself." This can be harder than it sounds. It is one thing to change your mind about your practice, it is another thing to change your habits. I often meet teachers, for example, who say they want to "work smarter instead of harder" when it comes to correcting student work but don't know how to achieve this goal. Having a toolkit of quick, practical feedback strategies makes it easier to address this problem. The handful of techniques described here are representative of the kind of small adjustments that can make assessing work a more collaborative and less onerous experience. Of course, asking students to take a more active role in responding to feedback is just one way we can reduce the workload burden of assessment—and assessment is just one of the workload burdens facing teachers. (I tell preservice teachers that teaching can sometimes feel like trying to drink from a fire hose.) However, these examples are emblematic of the way that being alert to time and workload pressure can help us design instructional practices that are more effective—and more sustainable. Such an approach safeguards not just the wellbeing of teachers, but, in keeping good educators in the classroom, that of the students they teach, too. 2 Hattie, J. (2012). Visible learning for teachers: Maximizing impact on learning. Oxford: Routledge. Glen Pearsall is an educational consultant whose areas of expertise include feedback and assessment, workload reduction for teachers, and instructional practice. His most recent book is Fast and Effective Assessment: How to Reduce Your Workload and Improve Student Learning (ASCD, 2018).